Aims and Objectives: To study the stress concentrations in endodontically treated maxillary central incisor teeth restored with 3 different fiber post systems subjected to various oblique occlusal loads. Results: The resultant data showed that the RelyX generated the least amount of stress concentration. Conclusions: Minimal stress buildups contribute to the longevity of the restorations. Thus RelyX by virtue of judicious stress distribution is the better option for restoration of grossly decayed teeth. Fiber post systems are routinely used in restorative dentistry. In the absence of solid consensus as regards the selection criteria of the post system, clinicians often succumb to marketing tactics as opposed to clinical evidence. This study attempts to bridge this gap by using finite element analysis model to analyze the effect of oblique loading forces and their stress concentration in the entire assembly when incorporated into the tooth structure. The likelihood of survival of a pulpless tooth is directly related to the quantity and quality of the remaining dental tissue. A post is commonly placed in an attempt to strengthen the tooth. However, in vitro and in vivo studies have demonstrated that a post does not reinforce endodontically treated teeth, despite improving retention when less than 3 to 4 mm of vertical height or around 25 to 50% of clinical crown is remaining. Recent developments in esthetic dentistry have supported the use of a fiber post to restore endodontically treated teeth. Fiber posts are improvements on other types of esthetic posts used in the past. The need for light translucent composite resins and ceramics to mimic natural tooth requires the use of translucent posts to replace metal posts in the esthetic zone of the oral cavity. The presence of a metal post can cause shadowing of the soft tissues adjacent to the root surface; this adversely affects the esthetic results required of bonded resin and ceramic restorations in the anterior region. Thus, the structural integrity and clinical longevity of post- and core-restored teeth are therefore strongly dependent on the state of stress created in their different regions due to occlusal loads. In addition to the magnitude and direction of such loads, the stress state at a given point within a restored tooth is also influenced by factors like the design and material of the post and the quantity and quality of the remaining root tissue. As the extensive loss of root dentin increases the risk of radicular fracture, appropriate mechanical behavior of the post is considered, in this case, to be fundamental to the success of rehabilitating restored teeth. Earlier, various methods have been used to study stress concentration in the tooth structures namely, photo-elastic studies (photomechanical investigations),  strain gauge studies, etc. Finite element analysis (FEA) is one of the more commonly used techniques for stress analysis. ,,, This basic concept of this technique is the visualization of actual structure as an assembly of a finite number of elements. FEA divides the problem domain into a collection of smaller parts (elements). An overall approximated solution to the original problem is determined. Three post systems from different manufacturers were used in maxillary central incisors (virtual model) and were subjected to forces so as to elicit data regarding their tensile strength. Varied biomechanical behavior under different stresses is expected as the post systems used are significantly dissimilar in their design, taper, and modulus of elasticity. A maxillary central incisor was created virtually using computer-aided designing (CAD) in a 2-dimensional model [[Figure 1]a, Mesial view]. Dimensions of the model were from samples of highest incidence. This design has all parts of an endodontically treated tooth, i.e., enamel, dentin, cementum, alveolar bone, gutta-percha, fiber-post, luting cement, and full coverage crown. Material properties like Young's Modulus and Poisson's ratio were provided to the design. The design had only one variation which was shape of three brands, Group-A (DT LIGHT POST, RDT, Bisco, France), Group-B (LUSCENT ANCHOR, Dentatus, USA), and Group-C (RelyX, 3M ESPE, Germany) according to their taper (due to design patent) and modulus of elasticity. Poisson's ratio-0.3 is applicable for all components of the design. DT LIGHT POST is double tapered; LUSCENT ANCHOR in comparison has parallel shape with taper in last 1.8 mm of the apical end and in contrast RelyX has uni-taper (8%) in middle third of the post shape [Table 1] and [Table 2]. Virtual model was rendered to Meshing [Figure 1]b, which represents division of the virtual model into smaller elements constrained by four nodes and they show dimensional changes as individual units; the entire design assembly was subjected to Finite element analysis software (ANSYS) for oblique loading forces (25 N, 80 N, and 125 N) at 60 degrees to the lingual surface of the incisor. The stress distributions were plotted by using color coding available with ANSYS software. When all three groups were subjected to analysis, Group C showed maximum stress distribution in the entire structure and least forces generated (stress concentration) at apical third of the tooth model, which was significantly different from other two groups. Group A and Group B were not significantly different in performance. The results [Figure 1]c in each model were presented in terms of the Von Misses stress values which decides the likelihood of failure of structure and material analyzed. When oblique forces were applied to the structure, the design showed movement in the direction of force applied, i.e., buccal flexion transferring compression at the interface of crown-core-dentin (coronal) near the CEJ (cemento-enamel-junction). Change in shades represents areas of stress concentration. Similar change of shades of colors occurred at gutta-percha-post-dentin (radicular) interface confirming stress concentrations at this junction that can act as potential site of bond failure. Colored bar at the bottom of the analysis showed maximum force (red) and minimum force (blue) generated when the analysis was conducted in ANSYS software. Values of color (red) are compared in all groups under various loads. RelyX showed least values at both ends of the spectrum. Minimal changes in colors were observed in apical third of the tooth structure that signifies complete dissipation of occlusal load and predicting potential absence of vertical fractures that were a result of using metal post in in vivo and in vitro experiments conducted in the past. The structure of the tooth which remains after endodontic treatment is usually undermined by previous episodes of caries, fracture, and tooth preparation. It is established that many detrimental effects produced during rehabilitative procedures are due to lack of understanding biomechanical principles underlying the treatment. All restorative materials have different modulus of elasticity from that of the tooth structure. The purpose of using products that have mechanical properties closer to dentin and enamel has always been to obtain best resistance and retention of the restoration done during application of dislodging or occluding forces, thus protecting the remaining tooth structure. When occlusal forces act on tooth surface, they divide into two components (vectors). One will be horizontal and other will be vertical component. Such forces create stresses as dentin is a dynamic structure and such stress escapes into dentin in the form of crack propagation, ultimately resulting in crazing. Lower modulus of elasticity helps dentin bear such stresses to a certain extent. Fiber post systems are a popular choice of modern dentists for replacing and restoring missing tooth structure in grossly mutilated teeth. This vogue of fiber post is due to their ease of handling, manipulation, and impeccable esthetic value, especially for anterior teeth. FEA is a mathematical analysis of designs which can demonstrate the amount of stress generated on application of forces and site of fracture and application of this technology in dentistry is very important which can reduce operator's bias during sample preparation for in vitro studies. Variety of products in the same genre always adds to dilemma of choosing rightly. Anterior teeth subjected to oblique forces angulated at 60 degrees form the long axis on the lingual surface as mandibular incisors contact the maxillary teeth at this angulation. Three different amounts of forces were chosen to observe behavior of post system from mild forces (25 N) for biting to heavy bruxism forces (125 N) and a near mean average of the forces (80 N). RelyX, when subjected to forces within the parameters of the study, resulted in least amount of forces (stress concentration) that reached the gutta-percha-cement-post interface [Figure 1]c at the apical third of endodontically treated tooth. This result can be attributed to the parallel fibers present in the post and unique modulus of elasticity, which provided better resistance to applied forces [Figure 1]d.
RelyX fiber posts are made from glass fibers embedded into a composite resin matrix. For superior mechanical properties, the glass fibers have parallel orientation and are distributed equally over the surface area. Additionally, during the manufacturing process, the glass fibers are pretensioned for enhanced post stability. Therefore, during the clinical application, RelyX fiber posts have to be cut with a diamond disc (according to manufacturer's specifications provided in product brochure). In a restored tooth, when the loading angle is kept fixed, increasing the load was found to increase the Von Misses stress. Applying this data to a real model, one can suggest that the loading at which the tooth is being subjected may not create immediate failure in the tooth, but may create cracks in the tooth assembly which may, over a duration of time, cause catastrophic failure. A virtual model cannot completely mimic an in vivo model that is subjected to all types of occlusal forces. A 2-D model can never represent an actual 3-dimensional tooth structure. Also, the accuracy of the entire analysis depends on software, model created, and elemental values given to the study. Incorrect values as inputs and inaccurate design can lead to varying results which are vulnerable to wrong results. An accurate estimation of results can be obtained which can increase anticipation for a better clinical performance, when mechanical testing for failure will be conducted, and improves their predictability. Disclaimer: As the author of the abovementioned article, affirm that I neither have financial affiliation (e.g., employment, direct payment, stock holdings, retainers, consultant-ships, patent licensing arrangements, or honoraria) or involvement with any commercial organization with direct financial interest in the subject or materials discussed in this manuscript, nor have any such arrangements existed in the past three years. Within the confined limitations of FEA, in the given framework, Fiber post RelyX (3M) is the best choice among other competitive products available, resulting in longevity of the restoration that is the final goal of the grossly decayed teeth. It is conclusive from the results of the study that fiber post system with components of higher modulus will enable better stress distribution. Additional observations suggest that when oblique load (tensile) is applied on a tooth restored with fiber post, there is high stress concentration at gutta-percha-cement-post interface. Also, the stress concentration was present in the immediate vicinity of apical end of the post and was found to be inversely proportional to the Young's Modulus value of the post system used. Mechanical testing of these products with larger sample sizes are required to support the result of studies conducted using FEA. Mr. Atul Borkar (B.E Mech) for support through knowledge of the used software. 1. Moammadi N, Kahnamoii MA. Effect of fiber post and cusp coverage on fracture resistance of endodontically treated maxillary premolars directly restored with composite resin. J Endo 2009;35:1428-32. 2. Kishen A, Asundi A. Photomechanical investigations on post endodontically rehabilitated teeth. J Biomed Optics 2002;7:262-70. 3. al-Omiri MK. Fracture resistance of teeth restored with post-retained restorations. J Endod 2010;36:1439-49. 4. Narayanaswamy S. Finite element analysis of stress concentration in class V restorations of four groups of restorative materials in mandibular premolar. J Conserv Dent 2008;11:121-6. 5. Vasudeva G. The effect of occlusal restoration and loading on the development of abfraction lesions: A finite element study. J Conserv Dent 2008:11:117-20. 6. Amarante MV, Pereira MV. Virtual analysis of stresses in human teeth restored with esthetic posts. Mat Res 2008;11:459-63. 7. Ash MM. The Permanent Maxillary Incisor. Wheeler. Textbook of anatomy, physiology and occlusion, 6 th ed. New Delhi: Saunders Publishers; 1998. p. 118-37. 8. Ricardo J. Influence of the remaining coronal structure on the resistance of teeth with intraradicular retainer. Braz Dent J 2005;16:197-201. 9. Natali AN, Carniel EL. Investigation of bone inelastic response in interaction phenomena with dental implants, Dent Mater 2008;24:561-9. 10. Uddanwadiker RV, Arya H. Effect of non-linearity of PDL on a restored tooth. Eur J Prosthet Rest Dent 2008;16:146-57. 11. Soares CJ, Santana FR. Finite element analysis and bond strength of a glass post to intraradicular dentin: Comparison between microtensile and push-out tests. Dent Mater 2008;24:1405-11. 12. De Jager N, Pallav P. The influence of design parameters on the FEA-determined stress distribution in CAD-CAM produced all-ceramic dental crowns. Dent Mater 2005;21:242-51. 13. Ruse D. Propagation of erroneous data for the modulus of elasticity of periodontal ligament and gutta percha in FEM/FEA papers: A story of broken links. Dent Mater 2008;24:1717-9. 14. Asmuseen E, Peutzfeldt A. Class I and class II restorations of resin composite: An FE analysis of the influence of modulus of elasticity on stresses generated by occlusal loading. Dent Mater 2008;24:600-5. 15. Cheng R, Zhou XD, Yang H, Gao QH, Hu T. Finite element analysis of the effects of three preparations techniques on stresses within roots having curved canals. Int Endod J 2009;42:220-6. 16. Santos AF, Tanaka CB. 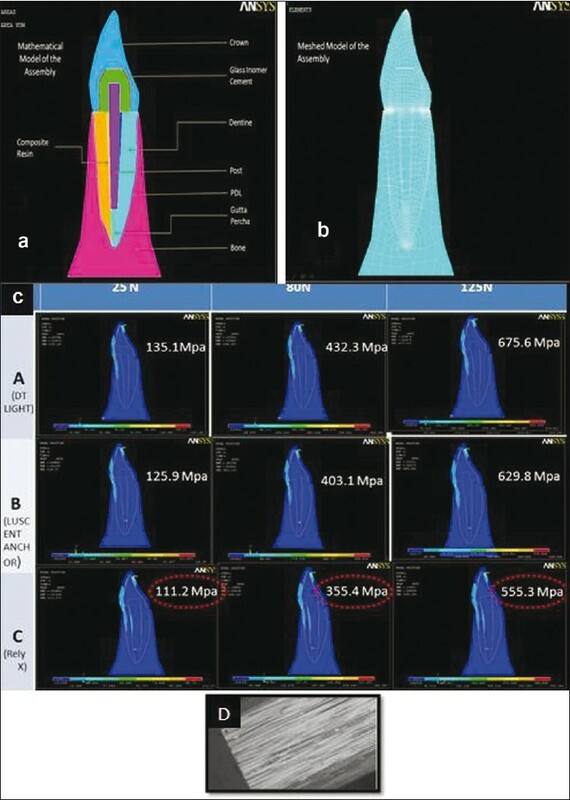 Vertical root fracture in upper premolars with endodontic posts: Finite element analysis. J Endod 2009;35:117-20.